In the first hour of the hugely publicised ‘Dharm Sansad’, there were, in fact, more people seated on stage than in the audience, discounting VHP’s special invitees and volunteers. Could a fatigue over Ram Mandir be the reason? On February 1, in the biggest assembly of Hindus across the globe, the Kumbh, chiefs of the largest Hindu organisation, the Sangh, were presiding over the most popular Hindutva issue — Ram Mandir. One by one, over two dozen seers seated on a stage took over the mic to address a half-empty hall. In the first hour of the hugely publicised ‘Dharm Sansad’ on Ram Mandir, there were, in fact, more people seated on stage than in the audience, discounting VHP’s special invitees and volunteers. Could a fatigue over Ram Mandir be the reason? Only two days earlier, a different conclave on Ram Mandir, ‘Param Dharm Sansad’, presided over by Shankaracharya Swaroopanand Saraswati of Dwarka Peeth ended with Swaroopanand asking all Hindus to gather at the disputed site in Ayodhya on February 21 and lay the foundation stone of the grand Ram temple. It was a direct challenge to the Sangh’s authority on the Ram Mandir issue. The Sangh responded, in its two-day event held from January 31, through a show of unity, flexing its entire organisational strength on stage. RSS chief Mohan Bhagwat, RSS joint secretary Krishna Gopal, VHP chief VS Kokje, Janmabhoomi Nyas chief Mahant Nritya Gopal Das, yoga guru Baba Ramdev, ISKCON Bangalore chief Madhu Pandit Das and BJP leaders, including Uttar Pradesh deputy chief minister Keshav Prasad Maurya, were at various times present over the course of the event. 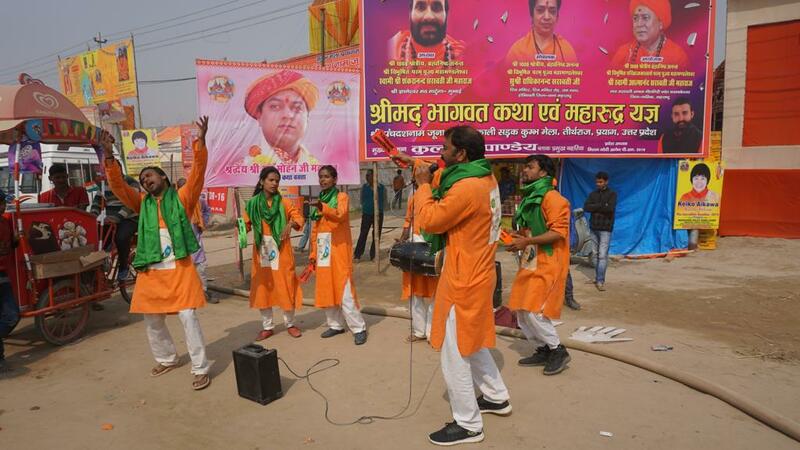 Praises were sung for Prime Minister Narendra Modi and chief minister Yogi Adityanath and some, like Baba Ramdev, went as far as to ask the sadhus present to mobilise their followers in the upcoming elections. Also, Bhagwat clarified that the Sangh will wait for the general elections to get over before taking any fresh call on the issue. Last December, during a huge event on the Mandir held in the capital, RSS vice-chief ‘Bhaiyyaji’ Joshi had said that “those in power” should respect the sentiments of the masses. Three months ago, in his Vijayadashami address, Bhagwat had said the government should pass a law for construction of the Ram Mandir instead of “testing the patience of society”. The audience, which had so far been blowing conches and chorusing “Jai Shri Ram”, fell silent. Chaos spread through the audience. 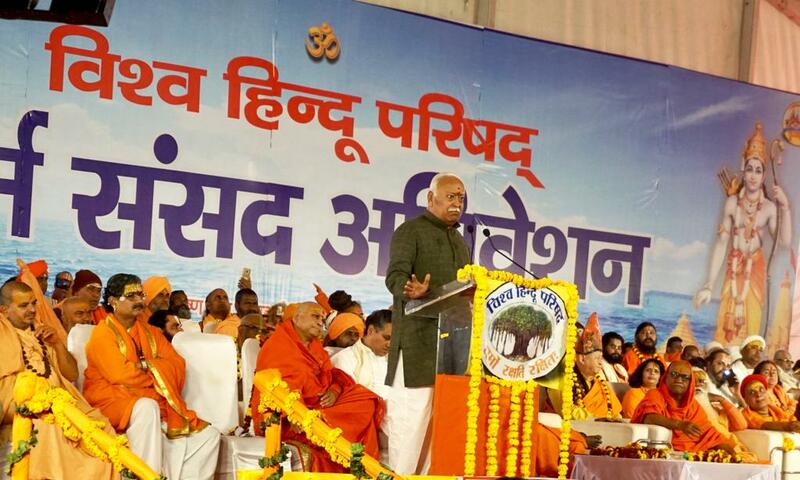 The couple of hundred people present in the audience stormed the front rows where they clashed with VHP volunteers, demanding from the luminaries on the stage a date for shilanyas (stone-laying ceremony) and using strong words against Bhagwat and other Sangh leaders. “Kya muh leke jaayenge waapis? Jaisa sandesh ye log de rahe hain, RSS, VHP aur sadhu santo ki baat se logon ka vishwaas uth jayega (The kind of message they are conveying will rob people of their faith on RSS, VHP and seers),” Sushil Kumar Saraswati, from neighbouring Pratapgarh, was one of those who clashed with the VHP volunteers. He added, “Bhagwatji ne tareekh ki ghoshna kyun nahi ki? Kyunki wo jaante hain ki ek baar tareekh ki ghoshna kar di to fir hum janta ko control nahi kar payenge (Bhagwat didn’t announce the date because he knows once the announcement is made, it would be difficult to control the masses),” Saraswati said. The 60-year-old man claimed to have been active on the Ram Mandir issue since well before ‘92 December. Many walked out of the event, while sadhu after sadhu kept asking the audience to vote the BJP to power again to ensure the construction of Ram Mandir. The already thin audience over time dwindled to almost nothing. 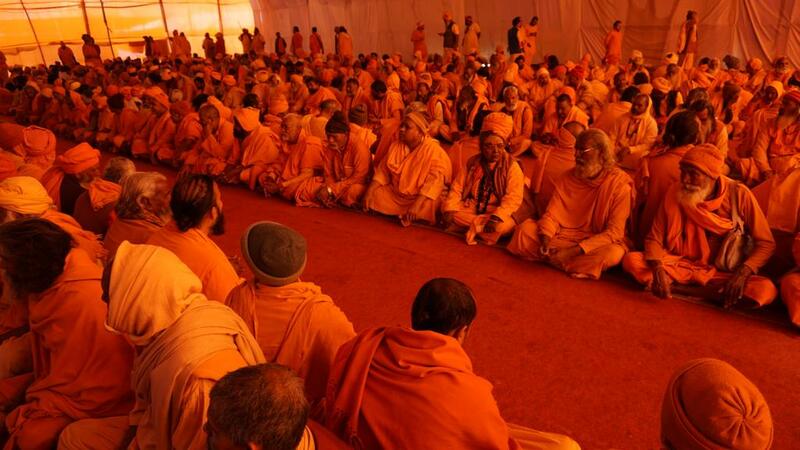 Apart from Swaroopanand and the Sangh, there is just one other influential segment present in the Kumbh whose vote on Ram Mandir also matters — the akhadas. There are said to have been 13 militias of sadhus, or akhadas, centuries ago, roots of which some trace back in mythology to Parshuram and Agastya. These akhadas were infamous for the brute force with which they suppressed other akhadas and fought outsiders. 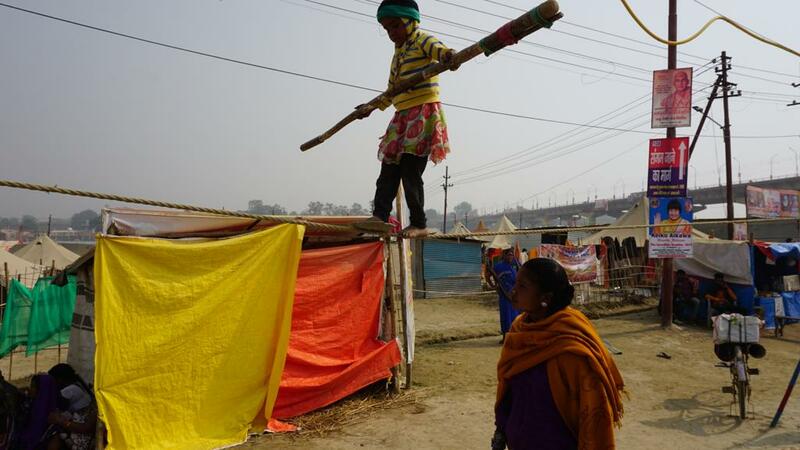 Scores of them co-exist now, more or less peacefully, and many of them have placed giant tents in the Kumbh occupying acres and acres of space. 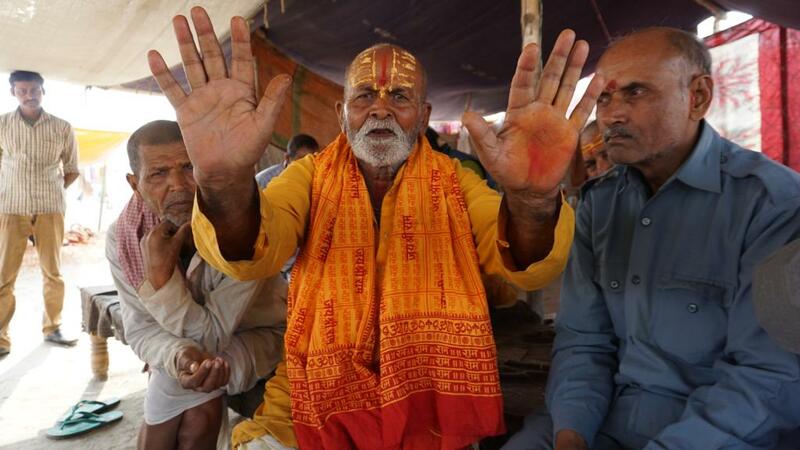 Each claims to be more influential, commanding loyalties of more sadhus, than the other. So, what about Ram Mandir? “Mandir needs to be built. But we need to look at the law of the land also. After all it’s here that we live. It should be built soon, but peacefully and without any more controversy,” says Gopal Krishn Satyam, a sadhu and kathavachak at the Aadinath Akhada. “It has already taken so much time. What’s the big deal if it takes some more? Today there is a race to claim credit. Nobody seems serious actually. And the youth anyway is more interested in getting jobs, let’s be clear on that,” Satyam adds before resuming his sermon on stage. Sadhu of another Akhada, Agni Akhada, expresses impatience. “If they say that a grand Ram Mandir will be built in 2020 then shouldn’t the construction work begin now? Swaroopanandji’s word has to be honoured. He is the Shankaracharya of two peeths. Who in the Hindu Samaj has greater authority on religion than him? By what authority is the VHP holding a Dharm Sansad?” says Mahant Gopal Anand Maharaj of Agni Akhada. “Today, BJP has called a Dharm Sansad, tomorrow Congress will call one, day after SP and then BSP. This has become a joke for them. Neta logon ko Ram Mandir banane ka theka kisne diya (Who gave the authority to politicians to build Ram temple)?” His colleague Mahant Sachiv Som Swaranand says. Yet another sadhu at the Akhada jokes that if, like the Ayodhya title dispute, the dispute between Kauravs and Pandavas was also tried in courts, it would have remained pending, centuries later, till today. A sadhu from the influential Juna Akhada expressed his outfit’s position on Ram Mandir, but on condition of anonymity. The Akhadas too, like regional parties, were trying to pull their own weight on the issue. They are taking their time to consider which view — between that of Swaroopanand and of the Sangh, who, to take the metaphor forward, were behaving antithetically like the two national parties — to align themselves with. However, the question of Ram Mandir seemed to be confined to just these three power centres. Keeping in mind that the Kumbh, spread over 800 acres, in which at any instant roam crores of visitors, is right now the centre of attention of billion-plus strong Hindu Samaj, the issue of Ram Mandir was remarkably almost absent from public discourse. VHP’s marquee, where the two-day event was being held, was nearly as full of ordinary people as any other venue. At some distance from the VHP event, Rajveer Singh Gaur’s troupe performing a nukkad natak ‘Safai ka Superman’ held scores of people, including sadhus, in rapt attention. Four-year-old Chandni, walking a tightrope with one foot tied to a plate, had within minutes of starting her performance, begun attracting attention of curious visitors. “Dekhiye, is sawal mein ab gati nahi reh gayi hai. Yeh ek bhavnaatmak dhruvikaran ki koshish hai ye sab samajh chuke hain (no wind remains in Ram Mandir issue anymore. The fact that there is an attempt to polarise people is evident to everyone),” says Surya Narayan, associate professor in the Hindi department at Allahabad University. “A lot of youth were born after the demolition of Babri Masjid. Someone who was born when the masjid was demolished is 27 today. Some of them have joined MNCs and travelled abroad. Others aspire to do that,” he adds. “Also those who visit the Magh Mela at the Sangam every year know that the big sadhus talk about Ram Mandir for a month and earn enough to spend the rest of the year comfortably in its name. Kumbh is a mela for most of us. You take a dip, sit through a pravachan, buy a souvenir, look at some spectacle and leave by the next train,” Narayan adds. Gopal Krishn Satyam of Aadinath Akhada doesn’t dispute the fact that Kumbh is, apart from everything else, a political event. “Politicisation of Kumbh didn’t start yesterday. The process started in Indira Gandhi’s time. Sadhus, akhadas, everyone else was always inclined one way or another. Some are aligned with the BJP, some with SP, some with Congress, some also with the BSP. It’s a social reality. I don’t see it as a problem,” Satyam says. Mark Twain was in all probability talking about the Kalpwasis while describing a Kumbh at Prayag that he witnessed in course of his round-the-world lecture tour in 1895-96, which he documented in ‘Following the Equator’. Away from the bustle of the akhadas, contortionist sadhus, street performers, missing persons announcements, the humdrum of Ram Mandir, away from all noise, reside the devotees which lend to the Kumbh an air of historic sanctity. Thousands of them, many who have made it here on foot, have taken a month-long pause from their livelihoods to live here in small tents in a separate corner of the Sangam. For a month – from Makar Sankranti (January 14) to Kumbh Sankranti (February 13) – the Kalpwasis live a spartan life; cooking their own food on earthen posts and eating once a day, bathing thrice a day, offering aarti twice a day, and spending the rest of their time listening to pravachans. “Magh mein idhar aane ka uddeshya shuddikaran hai. Ek mahine ka tap hai. Is mahine mein hum bairagi hain. Aadhyatm mein hi pura samay lag jaata hai (The purpose behind coming here is purification. This is a month-long penance during which we are free from worldly affairs. We spend our time in spirituality),” says Baijnath Mishr, who has come from Saharsa, Bihar. This austere month-long pilgrimage has to be done 12 times by devotees to attain moksh (liberation). But the exercise isn’t without worldly benefits of its own. A study, funded by UK-based Economic & Social Research Council and conducted by experts of five universities, including Allahabad University, has found that the Kalpwasis return home healthier and happier after their stay at the Sangam. A part of the findings was published in the Guardian and in the journal PLoS One. Baithjath Mishr sits with his other Maithili colleagues who complain about how the government, in the race to please all the big sadhus, has completely blanked them out. “Bade baba log ke liye deluxe toilet Dilli se mangwaye jaa rahe hain. Yogi baba bhi cabinet ke saath meeting karte hain toh special tent mein. Aur hame na paani diya hai na toilet. Bataiye mahilayein kahan jaayengi. [Big sadhus get imported toilets. Yogi (UP CM) also holds his cabinet meeting in special tents but we are not provided with either water or toilets. Where will the women go),” complains Phoolbhadra Jha who has come from Darbangha. But, we ask them, what about Ram Mandir? “Ye Kumbh dhyaan aur ekatm ka waqt hai. Hum kisi nirmaan ke liye nahi aaye. Bataiye in Ram bhakton mein se kaun kaun apne kul guru ko poojte hain (Kumbh is a time for solitude and meditation. We haven’t come here for any construction work. Tell me of all these ‘Ram bhakts’ here, who still worships his/her local deity? )” says Bhagwan Charan from Janakpur. “Everything on that side is commercial. Everyone has opened their own shop and are selling spirituality. Some baba had sent his car to us to get to his tent. Some VHP people also asked us. But we are people from Mithila. We are not fools. We know what they’re doing,” another Kalpwasi, Pancham Singh from Purnia, says. Bholanauth Chander was a Calcutta-born writer, a contemporary of Michael Madhusudhan Dutta and Bhudev Mukhopadhyay. For a travelogue that he was commissioned by the Raj in 1860s, Chander roamed the length and breadth of the country and wrote about his experiences, which were later published in ‘The Travels of a Hindoo’ in 1869. This entry was posted in Kumbh and tagged Kumbh2019, RSS.